Between 1882 and 1914 twenty-four patents were granted either to T. G. Hawkes or to individuals who were closely associated with his company. 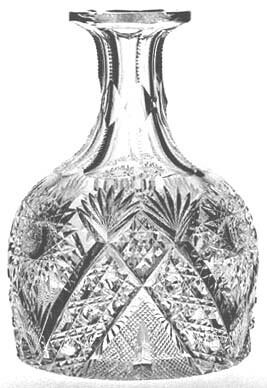 Seventeen of these patents, including one in an engraved style called “gravic”, were devised by T. G. Hawkes himself; two, also in the gravic style, were designed by his son, Samuel Hawkes; and one, a design patent for a French-dressing bottle, was granted to Townsend deM. Hawkes, a cousin. In addition, a patent was granted to Philip MacDonald, a glass cutter employed by Hawkes who assigned the patent to his employer. This is the only design patent so assigned. Two patents were issued to Richard Briggs, a Boston merchant, who had the company produce the designs for his customers exclusively. The Briggs patents, therefore, are traditionally listed along with the Hawkes patents. Finally, a patent was granted to Walter Egginton who was working for T. G. Hawkes & Company at the time of the patent. Beginning with patent no. 20,257 (Chrysanthemum) and continuing through no. 26,731 (Festoon) T. G. Hawkes named the patterns in his application papers, and these names appear in the company’s catalogs. Walter Egginton also named the pattern in his 1893 patent (Valencian), and he took the patent with him when he joined his father at the O. F. Egginton Company, established three years later. Richard Briggs referred to his two patterns as Louis XIV, using the same name for both patents. The second patent, no. 19,106, has a medallion for a monogram and was the version that Briggs “usually” ordered from Hawkes according to Spillman (1996, p. 180; fig. 8-42). 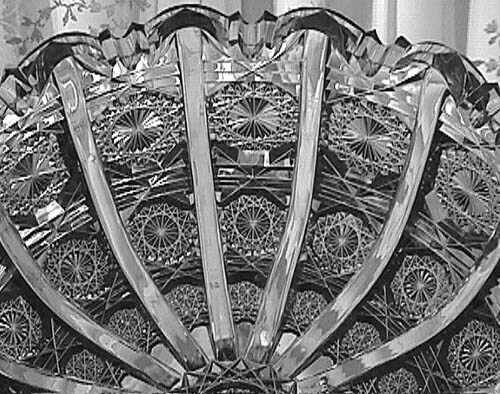 After the patent expired H. P. Sinclaire & Company also produced the Louis XIV pattern, re-naming it Marie Antoinette (Sinclaire and Spillman 1997, p. 15). A few patented patterns have assigned or “coined” names. That is, they have names temporarily assigned to them by writers for identification purposes, to be used until official names become available. The “coined” names are always enclosed within quotation marks. The “MacDonald” pattern is discussed in the russian1.htm file in Part 1. The name “Maltese Cross” was chosen by A. C. Revi (1965, pp. 180, 183) who tended to use words that are found in a patent’s specification. No catalog name for “Maltese Cross” has surfaced to date (note 1). The Russian and Notched Pillars pattern appears as Russian and Pillar in Daniel’s book and in the work of Revi, Pearson, Sinclaire, and Spillman, all of whom have copied Daniel who probably acted upon on a suggestion from Samuel Hawkes. While Russian and Pillars (plural) is an authentic Hawkes pattern-name, it was given by Hawkes to a pattern that was never patented, one that (logically) does not contain notched pillars. Therefore, it is markedly different from the patented pattern which, it is suggested here, be known as Russian and Notched Pillars, and not Russian and Pillar(s), to avoid confusion. A pattern with this name was sent to the Paris Exposition of 1889. It differs only slightly from the patent, so there is a good chance that Russian & Notched Pillars is actually the official name for this patented pattern. The writer has yet to find the pattern in a Hawkes catalog. The first half-dozen patent applications use photographs. Beginning with the Richard Briggs patents, line drawings replace the photographs, because the latter failed to show all the required detail. 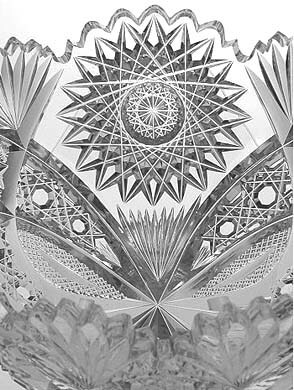 Actual specimens of cut glass would typically be sent to the patent lawyers — Knight Brothers of Washington, DC in the case of Hawkes — who would have professional draftsmen prepare the line drawings. It is believed that the patentee would also submit a draft of the patent proposal to the lawyers who would render it in language acceptable to the U. S. Patent Office. 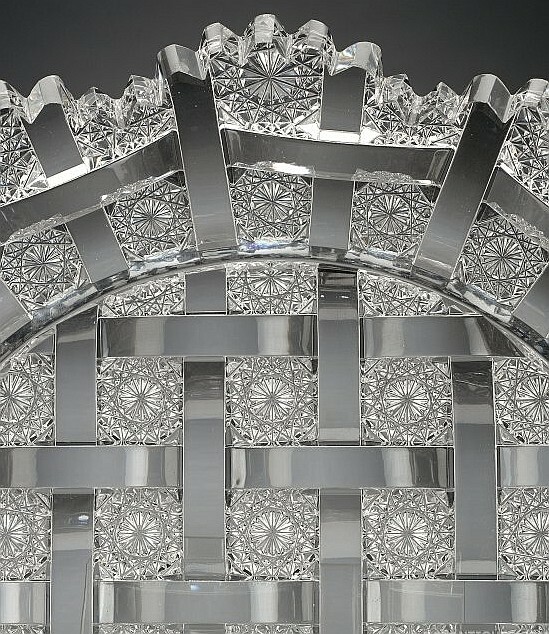 This would account for the absence of terms familiar to glass cutters and the inclusion of expressions that the glass companies themselves would not normally use. The verbal descriptions also contain inconsistencies, such as use of the term “rosettes”, that suggest the likelihood that different lawyers were employed in writing the individual specifications. The following compilation is based on the U. S. Patent and Trademark Office’s Web site where the reader can find complete patent applications, including specifications and (usually) drawings, the latter of best-available quality. Revi’s early work (1965, pp. 172-190) and the J. Stanley Brothers, Jr. volumes of patent material at the Rakow Research Library have also been helpful. The Briggs patents (nos. 19,105 and 19,106) are listed here because Hawkes was involved in their patents and subsequently was the exclusive manufacturer of items in these patterns. Please see the briggs.htm file in Part 4 for additional information. Philip MacDonald assigned his patent to Thomas G. Hawkes, the individual, not the company. All of the other patents listed here were retained by their patentees; they are marked with asterisks (*). 18,268 / “Star Rosette” (Empress?) / Thomas G. Hawkes / 9 Jan 1888 / 24 Apr 1888 (*) See the Hawkes 7 file for additional information. 1. Spillman incorrectly attributes the name “Maltese Cross” to Dorothy Daniel. She reports that this pattern “does not appear under that name (or any other name that I could find) in any orders or in any of the early [Hawkes] catalogs…” (Spillman 1996, p. 183). 2. 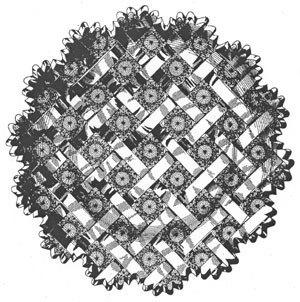 Although Spillman (1996, p. 92) states that the Cobweb pattern was patented, no patent record has been found. 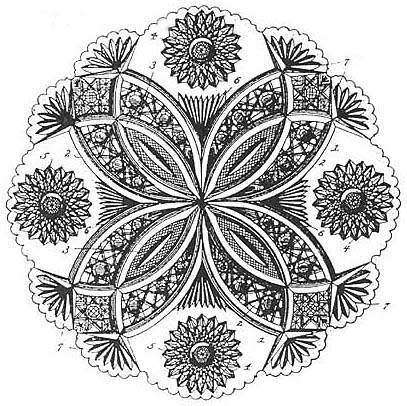 The Chrysanthemum pattern, pat. no. 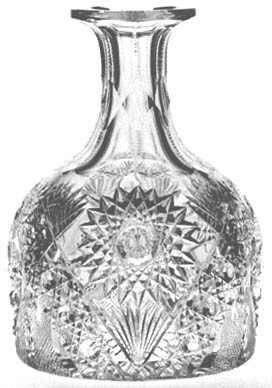 20,257, is shown below as the patent’s drawing, and as cut on a finger bowl and on a carafe. Motifs: Cane, Fan, Hobstar, “Middlesex” Hobstar, Single Star, Split, Strawberry Diamond. Two views of the carafe are necessary in order to show the entire patern. Finger bowl: H = 4.5″ (11.4 cm), H = 2.25″ (5.7 cm), selling price unknown (Images: Internet). Carafe: H = 7.5″ (19.0 cm), base D = 5″ (12.7 cm), wt = 3.25 lb (1.5 kg). Sold for $300 in 1989. In spite of the fact that it was extensively cut over a long period of time, the Chrysanthemum pattern is considered scarce today. As a result, asking prices are well above average. One convenient way to circumvent this situation is to consider acquiring the pattern on a small object. The typical 7″D individual ice cream/cake plate is ideal, but that form is very popular, with the result that prices are usually quite high. 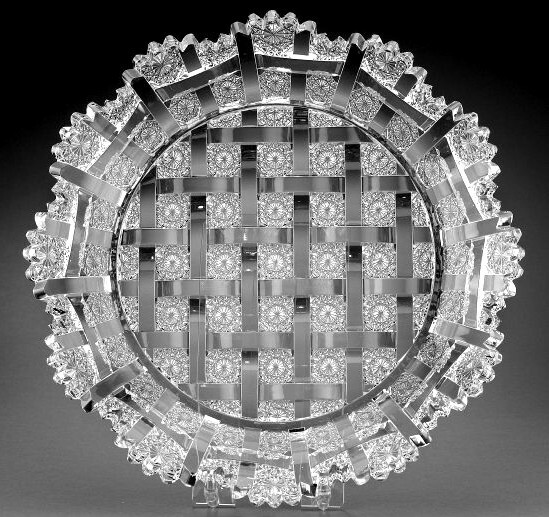 An alternative is the finger bowl, an excellent example of which is shown above. Two myths about finger bowls should be mentioned: Firstly, they do not invariably have smooth (uncut) rims. As shown here the rim can occasionally be cut in the scalloped-and-se style that is typically found on berry bowls. And secondly, finger bowls and underplates (if available) were sold separately. Consequently, a bowl without an underplate is not considered “incomplete”. Sometimes matching underplates are nowhere to be found in the catalogs that contain finger bowls; presumably their companies’ matching 7″D plates were enlisted to do double duty. But they too could be dispensed with. 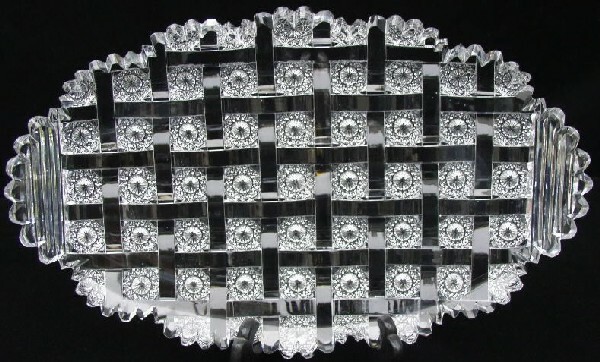 The hostess would simply place the cut-glass finger bowl on a ceramic underplate, separated by a doiley. Today a finger bowl and underplate on the table is something of an anachronism. The last time the writer was present with a set was in the dining car of the Twentieth Century Limited! As an eight-year-old he was mightily impressed. 2. 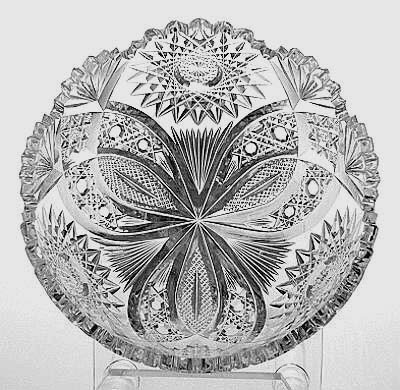 The Chrysanthemum pattern is not found on the inventory lists that accompanied the glass Hawkes sent to Paris. (The Grecian pattern, on the other hand, frequently appears on the lists.) 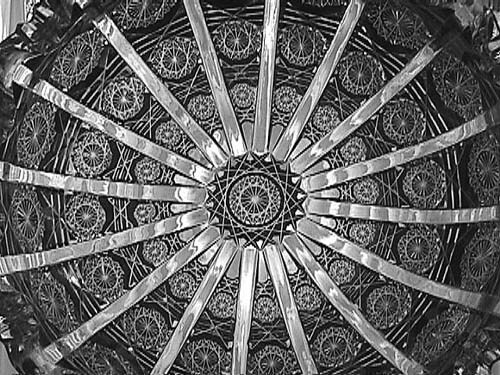 This is not surprising when it is realized that a full year passed before the patent application for the Chrysanthemum pattern was submitted to the USPTO, a full year after the Paris Exposition closed in October 1889. It is unlikely that the pattern existed anywhere during the summer of 1889, except, perhaps, in the mind of T. G. Hawkes. 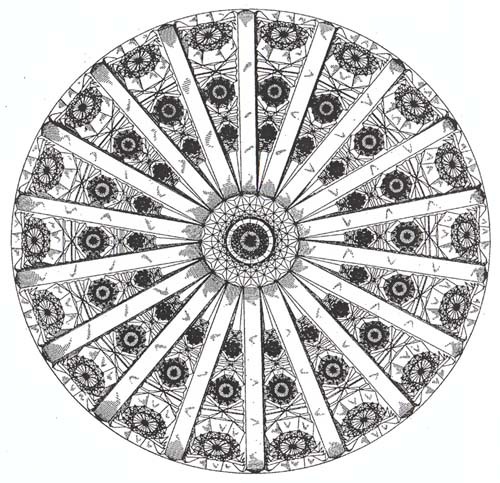 This drawing of the Panel pattern, which accompanies patent no. 40,195 at the USPTO, shows a bowl’s cut surface. As such, the pattern, which appears deceptively flat when viewed on its uncut surface (and which is the way it is shown in most cases, including the two photographs in this file) — has great depth. Note the thickness of the octagonal shapes that support the 8-, 12-, and 16-pt Brunswick stars. 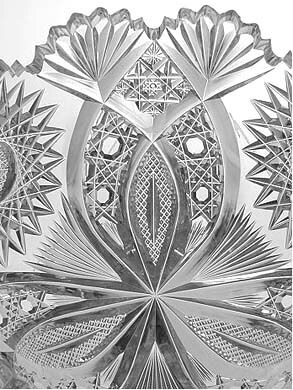 Close-up photographs of Hawkes’ Panel pattern as cut on a no. 700 bowl. D = 9″ (22.9 cm), H = 4″ (10.2 cm), wt = 6.7 lb (3.0 kg). Sold for $7,320 at an eBay auction in 2004 (Images: Internet). Example No. 1: An ice cream tray cut in the Willow pattern. L = 13.5″ (34.3 cm), W = 9.0″ (22.9 cm), wt = 4 lb (1.8 kg). Sold for $8,550 at an eBay auction in 2004 (Images: Internet). Example No. 2: A 12″D tray that was offered for sale on the Internet for $29,500 in August 2005.